This luxury apartment community, located in Mission Valley, Calif., and designed by Lifescapes International, offers several high-end amenities in its landscape. Dynamically designed lighting features allow for both safe travels as well as continued functionality into the evening hours. 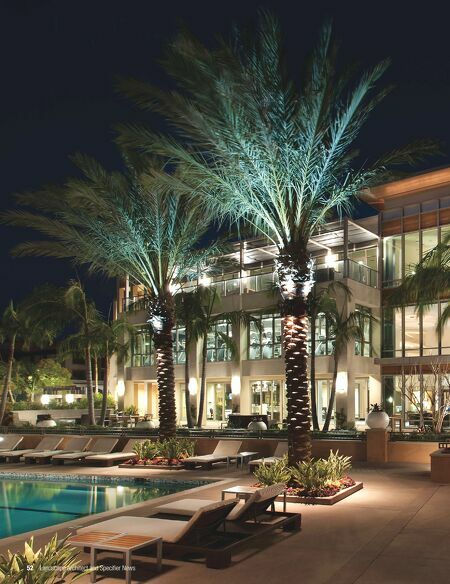 Even as residents walk away from the well-lit buildings, they can admire the plantings and meet with others in the social spaces imbedded throughout the site. 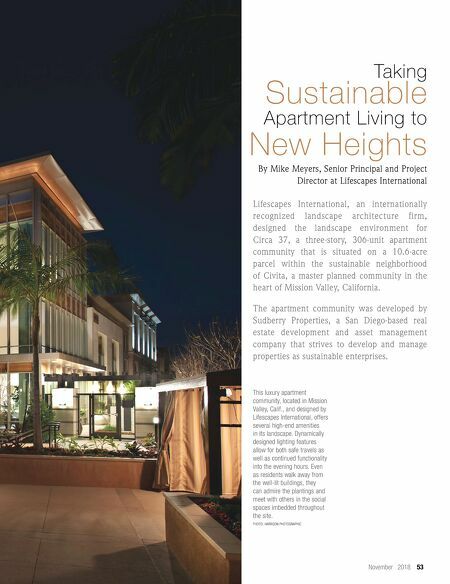 PHOTO: HARRISON PHOTOGRAPHIC November 2018 53 Taking Apartment Living to Sustainable New Heights By Mike Myers, Senior Principal and Project Director at Lifescapes International Lifescapes International, an internationally recognized landscape architecture firm, designed the landscape environment for Circa 37, a three-story, 306-unit apartment community that is situated on a 10.6-acre parcel within the sustainable neighborhood of Civita, a master planned community in the heart of Mission Valley, California. The apartment community was developed by Sudberry Properties, a San Diego-based real estate development and asset management company that strives to develop and manage properties as sustainable enterprises.